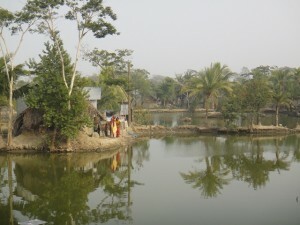 Backed by seed funding from Switzerland and Sweden, a local network of Bangladeshi civil society organisations including Association for Climate Refugees and Young Power in Social Action have focused efforts on acquiring viable land for resettlement as a key means of solving climate displacement caused by sea-level rise, tropical cyclones, riverbank erosion and flooding across the country. Under the rallying cry of “new land for lost land, new homes for lost homes”, this people-led movement is one of the world’s first efforts to fix what climactic events have destroyed. These efforts, though only at a embryonic stage, are in stark contrast to the efforts of many international agencies, NGOs and commentators who are content to describe and debate the parameters of the climate displacement crisis, but are far less willing or able to propose – let alone implement – actual, concrete solutions for people displaced by climactic events. This resistance may in part be due to the notorious difficulty in proving the precise links between climate change, natural hazards and displacement. However, in Bangladesh this need not be an excuse for inaction. It is well documented that the regular natural hazards that besiege the country have led to considerable displacement. It is also well documented that all of these natural hazards are expected to increase in both frequency and severity as a result of climate change leading to the almost inevitable displacement of many millions more across the country. In January 2012, the people-led “new land” initiative acquired the latest in a series of pledged land parcels that will be used to provide climate-displaced communities with a new start. To date, more than 3,500 acres of private land have been pledged to help solve the nation’s displacement crisis. All of the land offered to date has been given free of charge by Bangladeshi citizens concerned by the plight of the climate displaced and convinced that their contribution can make a difference to many lives. The land pledged so far will allow more than 16,000 climate displaced people the opportunity to move from vulnerable and exposed coastal and river basin areas to more than 20 sheltered and safe land plots across the country. In recent weeks, the donation of a 52 acre plot in Fuluar Char was confirmed and the process of transforming legal title to climate displaced communities was begun. The next step is for this initiative to turn this plot of land into a community land trust, to ensure that the site remains in ownership of climate displaced persons in perpetuity. Construction has begun at the site with houses, water wells and latrines; the first steps towards a genuine and durable solution for the many climate affected individuals and families across the country. The Government of Bangladesh, rather than focusing on domestic solutions, is looking outward and is increasingly demanding that the countries responsible for climate change have an obligation to accept climate-displaced people as “climate refugees”. But this approach is premature and could backfire as potential host countries, already too reluctant to accept refugees fleeing conflicts and human rights abuses, feel forced into a reactive, defensive posture leading to closed borders. Climate-vulnerable countries must focus their engagement on how the international community can assist with domestic solutions and only rely on international resettlement solutions when domestic ones are no longer tenable. Community-led efforts to acquire new land to fix climate displacement like those in Bangladesh demonstrate that domestic solutions are not only possible but that they may also be more likely to be rights-based, effective and durable. Early successes like these should be studied as one viable way to protect the housing, land and property rights of climate displaced people across the globe. Waiting until 2020 for the UN Framework Convention on Climate Change (UNFCCC) to stop global warming by limiting global carbon emissions is not good enough for the millions already living in displaced misery because of climate change. For the moment at least, taking guidance from people’s efforts in Bangladesh as climate carnage increasingly takes hold may be the best form of inspiration for solving the emerging crisis of climate displacement the world over. This entry was posted in Activism, Asia-Pacific, Climate change, Environment and tagged activism, Bangladesh, climate change, environment, refugees by Scott Leckie and Ezekiel Simperingham. Bookmark the permalink. Scott Leckie is an international human rights lawyer and recognised as one of the world's leading global housing, land and property (HLP) rights advocates. Over his 25 year human rights career, some of his notable achievements include; securing land to accommodate climate displaced communities in Bangladesh; protecting hundreds of thousands of people against forced evictions in communities in the Dominican Republic, Panama, Philippines, South Africa, Thailand and Zambia; restoring HLP rights to tens of thousands of people in Kosovo, Georgia, Albania and beyond; and fundamentally reshaping and significantly strengthening the body of international HLP rights policy literature. With more than two decades of practical human rights work and innovative problem solving experiences, he is regularly requested to provide advice to a wide range of United Nations agencies, governments, NGOs and grassroots groups. Scott has lived in 14 countries, including North America, Europe and Asia and currently resides with his wife and daughter near Melbourne, Australia. Scott is Director, Displacement Solutions. Ezekiel Simperingham is an international lawyer with over 10 years of experience specialising in human rights, rule of law and displacement issues. Since 2008, Ezekiel has worked as a legal consultant for Displacement Solutions, focusing on the design and implementation of legal and policy solutions to situations of displacement. Ezekiel previously worked for the Refugee Status Appeals Authority in New Zealand, the United Nations High Commissioner for Refugees in Australia, the International Center for Transitional Justice in New York and the International Commission of Jurists in Thailand. Ezekiel was awarded a LLM from the New York University School of Law and holds Bachelor of Laws (Hons) and Bachelor of Arts degrees from the University of Auckland. Ezekiel has authored a number of publications on refugee law, climate displacement, international criminal justice and housing, land and property rights. Good article about local initiative to adapt with climate change. But Bangladesh has only 1,44,000 square kilometer land where already more than 160 million people are living. So, it would be difficult for Bangladesh if sea level rise 1 meter in future that would cost 16 to 17% land inundation and 17 to 20 million climate migrants. 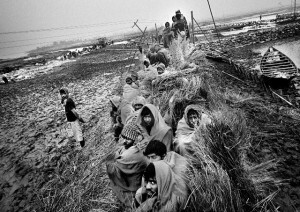 How Bangladesh would able to resettled a large number of people without any new land? Let there be a domestic plan for resettlement of the climate refugees and an institution for the climate refugees. An appropriate solution through resettlement in foreign countries will be adopted as and when necessary. Of 1971 Bangldesh owns the green natural boundary several disaster has led severity of damage. 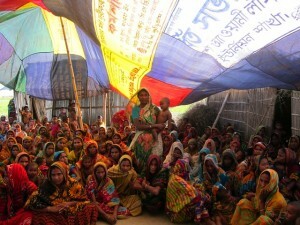 Climate-displaced Bangladeshis demands attention, law, though lawyer, and tenable hand to take leading. We admire Scott Leckie and Ezekiel Simpringham while climate-displaced are looking forward beyond reluctancy.Good article about local initiative to adapt with climate change. Wonderful article that reflects climate vulnerability of Bangladesh. Since the problem of displacement is rooted both locally and globally solutions too must have both local and international dimension, in two phases.First phase should emphasize on HLP plus.HLP plus will also include education as a powerful tool for the young generation in making property.Education will also equipp them to move to the other countries to work and get settled. As Bangladesh is low lying country , the southwest side is affected in various ways. The article is very important for the people of Bangladesh. Bangladesh is a low lying country and the people of southwest side are affected too much. The natural calamities and natural forces destruct the land and animals every year. For the betterment of the people of Bangladesh it is badly needed to take steps for the emancipation of the people through climate change, food security, shelter protection and promoting good education. Some areas also effected of climate changes in Rajshahi ,Chapai Nawabganj, Natore District under Rajshahi Division. We’re working for establish food security and improve livelihood for those vulnerable extreme poor peoples in mention above river basin areas from few past years to till now. Bangladesh is low lying country, the southwest side is affected in various ways. The article is very important for the people of Bangladesh who are affected for climate changes. And the HLP is the basic rights of human being. We heartily appreciate to the article and also wish to work on this issues for climate refugees in Rajshahi Division if get chance in near future. It is good to see that many people have commented like ‘important article’, ‘good local initiative’ but it is more important to know that the local individual donors have provided financial assistance to further the model of domestic land solutions when Scott Leckie’s Displacement Solutions abandoned the project. The Bangladesh HLP Consortium under the leadership of Shariatpur Development Society and Association for Climate Refugees are now working with the Environmental Justice Foundation for protection of rights of climate refugees. Climate Refugees in Bangladesh now have access to land through the local Community Land Trusts but need support for a house and livelihoods. The Rowmari model of domestic land solutions have a big impact across the country and there seems to be some light at the end of the tunnel regarding a durable solution to climate displacement in Bangladesh. Who are the members of the Bangladesh HLP consortium? I can’t seem to find out online. Globally Bangladesh is well recognized for its climate vulnerability. All parts of this country is more or less affected by the different types of disasters. Southern and south-west part of Bangladesh has been being seriously affected. Most development partners think that most southern part of Barisal division is more affected. From this view everybody goes to the Kalapara and Golachipa Upzila of Patuakhali and Amtali and Pathorghata Uapazila of Barguna district. But our practical observation reveals that Mehendigonj Upazila of Barisal division located in the north-east corner of Barisal city comparatively produces more climate refugees than any other Upazila. Mehendigonj upazila is located in the Barisal district and there is no road communication with district or divisional city and no possibility to be in future. 13 unions are totally isolated by the big rivers like Megna, Tetulia, Kalabadar and other unnamed rivers. Every union is affected by the river erosion and peoples are losing their lands along with homesteads very frequently. In this upazila a few NGOs are working only with micro-credit and there is a negligible NGOs are with development initiatives. The organization are working for climate refugees should be emphasized here. In terms of CRR(Climate Refugees Re-settlement) government khash land can be used coordinating with government. If sufficient khash land is not available, multi-storied building can be constructed that will be used also as cyclone shelter. If so, many families will possible to be rehabilitated within a piece of land.